Healthcare wait times are based on the recent experience of patients. While everyone’s path to wellness is different, seeing how long other patients wait for the same service helps care providers and patients work together to estimate the current wait time and consider their referral options. The 90% wait time shows how service is performing overall. Some people may wait longer, others less, but in the end the time someone waits depends on how urgent their situation is and the availability of healthcare resources. If there is a change in symptoms while waiting, patients should see their healthcare provider to get reassessed. Wait times for the most frequently accessed healthcare services are refreshed at the end of each month, while others are updated every three months or quarterly. 90% Served Within - This is the maximum time that 90% of patients recently waited. It is also called a 90th percentile. This wait time shows how service is performing overall. For example, if the reported wait time is 200 days, this means that 90% of patients had their appointment within 200 days of the service being requested. 50% Served Within - This is maximum time that 50% (half) of all patients recently waited. It is also called a median. This wait time generally includes the most clinically urgent cases. For example, if the reported wait time is 35 days, this means that 50% of all patients had their appointment within 35 days of the service being requested. Shortest Wait Time - When a procedure or service is offered by more than one specialist or community, we have highlighted where the wait is the shortest. This information gives patients and providers referral options. 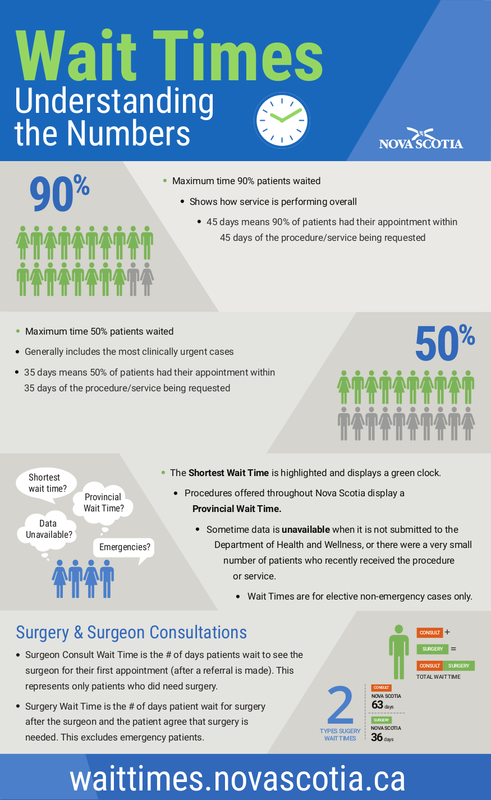 Provincial Wait Time - The wait times for services and procedures offered throughout Nova Scotia are often accompanied by a provincial wait time that combines all provincial sites or specialists together. Not all wait times are the same, and this number can be used to compare one a particular facility or specialist to the rest of the province. Surgeon Consult Wait Time - This is the number of days patients waited to see a surgeon for their first appointment after a referral is made. This is also known as a consult appointment. Not all patients need surgery. The wait time represents only patients who did need surgery. The wait time doesn’t include patients who have been under the ongoing care of a surgeon and were not considered to be a new patient for the surgeon, and patients who did not see the surgeon until the day of surgery. Surgery Wait Time - This is the number of days the patient waits for surgery after the surgeon and the patient agree that surgery is needed. The surgery wait time excludes emergency patients and any days that a patient was unavailable for surgery.